So when a friend told me about a Hydro Treadmill, the latest gadget on the Gym equipment front, this was intruiguing. Googling, up came this photo – and I thought if she could use it, so could I ! 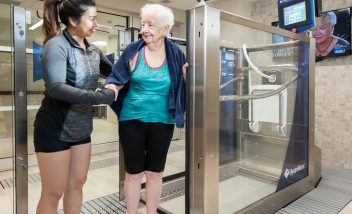 Circle Hospital in Reading has installed one of these Hydro Physio units, which use a powerful combination of warm water support and a treadmill for energetic exercise. This is tailor-made for anyone who has limited mobility, or just wants to get fit in a fun way, and as a very compromised person myself, this machine is perfect. The image shows an elderly patient being helped into the empty cabinet, with plenty of bars to grab on to. The physio ensures the patient is installed in the empty cabinet; holding on to handle bars. Then she presses a button and warm water flows gently in. As soon as it reaches up to your waist, you’re off! Fully supported in the water, weak muscles have no difficulty holding you up, whilst the treadmill floor gently increases in speed as you become confident, knowing the water will hold you up, whatever balance issues. I found it easy to walk, do gentle running, go sideways and even backwards, march with ‘high legs’, swing legs, ‘cycle’, and do any number of exercises which might be difficult without the support of water. I was moving freely, whereas on dry land I find walking can be challenging. Apart from benefiting mobility and giving a good work out, I found the warm water eases pain from arthritis and sore muscles, and the benefits last for several days. Years ago my Polio specialist said he wanted me to have weekly hydrotherapy “for the rest of your life”. Then when I developed cancer my oncologist was keen for me to have as much exercise as possible, and was delighted when I said I went to hydrotherapy every week. Living in London, there are plenty of NHS hydrotherapy pools. Then – I moved to Oxfordshire, and the post-code lottery kicked in. Six months after moving I am still waiting for a referral to the ONE NHS hydrotherapy unit! Oxford University NHS Hospitals say Hydrotherapy is excellent, and Clinical hydrotherapy is increasingly seen as an important therapy in the treatment of many conditions. Brilliant! Who writes these websites? Why not tell the truth, that if we want this we will probably have to ‘go private? Six months on from my original request, and STILL I haven’t even seen the Oxford Hydro pool. Is it a mirage? Does it exist? I was in despair, until a friend told me that they thought The Circle in Reading (just south of Oxford) offered hydrotherapy. It was private, but my mobility had gone downhill, and my Rheumatologist told me I was losing muscles at a rapid rate – not good. The Circle offered something different – a Hydro treadmill: an integrated treadmill which you stand on, the encircling glass doors are closed tight shut, and warm water swooshes in around you. There are see-through walls all around, so the Physio can walk round and make quite sure your feet, legs and body are doing what they are supposed to. No cheating possible!. Then the fun starts! You wobble, but the water holds you up. Then you get used to the treadmill turning underneath, and start walking. You could even run – but I am giving that a miss for the moment until I get stronger. Then you play – first of all I walk sideways – and wobble. But the water holds me up and I soon get the hang of it. I am given noodles to push under my arms, lean back and start cycling. This IS fun! it may help manage lymphoedema. Whilst I was there Mike was taking photos of my legs, and you could see the impact the water jets were having on lymph glands, helping pump the liquid up and down my legs. Gina told me cancer survivors using the treadmill say it helps with pain. I know that major cancer rehabilitation centres in Europe all offer hydrotherapy. Years ago my Polio specialist said he wanted me to have weekly hydrotherapy “for the rest of your life”. When I developed cancer my oncologist was keen for me to have as much exercise as possible, and was delighted when I said I went to hydrotherapy every week. Living in London, there are NHS and private hospitals with pools. I tried about eight different ones, and finally decided that Guys NHS Hospital was best for me. Excellent physios, who supervised three of us in the pool for 1/2 hr sessions, plenty of towels provided by the hospital (so I didn’t have to lug a heavy one in with me) and lots of grab rails in the showers – all for £20 a session. I did start out at King Edward VII Hospital – they have Molton Brown goodies, where in NHS pools you have to bring your own, and the Physios are excellent. But, it is £80 a session. However, London has pools for everyone, with some such as Chelsea and Westminster and Charing Cross Hospitals offering sessions at £5 a time – but no Physio to supervise. Apparently the basic price for an aqua treadmill is around £50,000. This has got to be miles cheaper than building a hydrotherapy swimming pool. Hospitals take note! This is for the girls – finding a glamorous swimsuit that doesn’t rot in the hydro water I found a lovely black one made by Wolford. Black of course slims down one’s outline, even mine, but what I loved was a silver band of decoration all round the edges, Very glamorous! On a practical note, the swimsuit is made of some ‘miracle’ material, which is said to last a long time in the water.